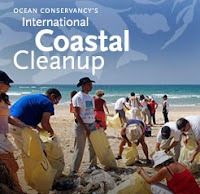 Just a reminder that this Saturday (the 20th) is Ocean Conservancy's International Coastal Cleanup . As we mentioned in an earlier posting, this event differs from standard beach cleanup events in that the trash is tabulated and cataloged world-wide. But as is noted on the web site, "... this is more than a one-day event, it’s a year-round movement. The ocean is essential to the health of everything on our planet. But harmful impacts like climate change and overfishing are taking its toll. The International Coastal Cleanup provides a direct, tangible way to make a difference. Trash in the ocean kills countless seabirds, marine mammals and sea turtles each year through ingestion and entanglement. The International Coastal Cleanup brings awareness and action to one of the largest problems we face. " Locally, Florida Coastal Cleanup effort is being coordinated by Keep Brevard Beautiful (this link leads you to the check-in sites list). Per the web site, "Keep Brevard Beautiful, Inc. invites beach lovers, anglers, bird watchers, surfers, school, church and civic groups, and people of all ages to participate in the Florida Coastal Cleanup on Saturday, 20 September, 2008 8:00 a.m. to Noon. ... Materials needed for the cleanup activities, including trash bags, gloves, sunscreen, data cards and pencils, will be provided. Volunteers may want to bring drinking water and a snack. FREE T-shirts while supplies last! Check-in sites are located throughout Brevard County. We especially need boaters to assist with the spoil island clean up activity!"